Rendering items in third person view is very similar to first person view. The entry point is RenderPlayer.renderPlayer(), which calls RenderPlayer.renderSpecials(). After performing a number of translations depending on the item type and what actions the player is performing, it calls ItemRenderer.renderItem() as described for First Person View rendering. 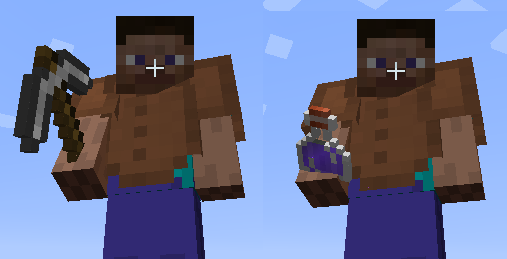 If the item is 2D and Item.isFull3D() returns true, the item rotates so it lies in the plane of the player's arm, and also makes it a bit bigger. Otherwise it lies in a plane normal to the arm. See picture below. Vanilla items which return .isFull3D() are eg tools, swords, fishing rod.